Not a lot of time needed here. Not a lot of time needed here. Took awesome photographs and spent about 15 minutes. The steps were closed for repairs the day we were there. Currently closed for repair. We just drove by. Not accessible due to maintenance. Nothing special. Construction obscuring some views. Could have skipped. Fantastic day with Laura and Private Tours of Rome. Under construction. Wonderful walking tour with 15 people. Excellent, well organised, cheaper than most tours, using public transfers. Capable guide. Will use CBM again! Well done! You can call by the Spanish Steps easily on you walking tour, maybe via Trevi Fountain? 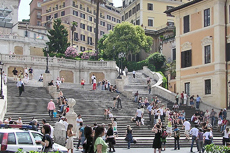 You can call by the Spanish Steps easily on you walking tour, maybe via Trevi Fountain? There are some nice designer shops in the square & a few nice cafes if you need a sit down! The guided tour was great we saw lots of the sights of Rome in one day. The guided tour was great we saw lots of the sights of Rome in one day. This was a very active day with lots of walking but plenty to see - i would love to do it all again to capture the sights a second time.